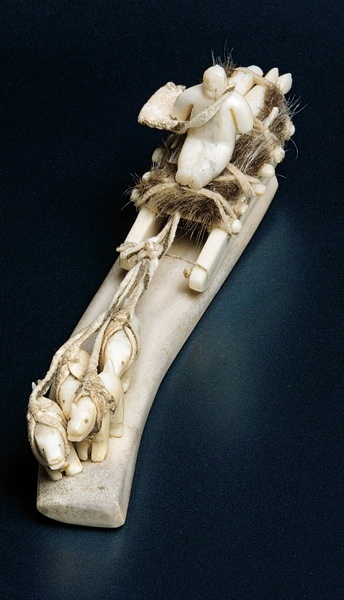 The Inuit artist who created this dogsled from carved ivory, leather, and sealskin is unknown. The sculpture comes from Kugaaruk, an Inuit community in Canada's Nunavut Territory. Nash, A.B. 1907, was a Boston stockbroker and serial collector--of Colonial tools and furniture, New England coinage, and, in his seventies, Inuit art. His strong interest in wildlife took him to Churchill, Manitoba, known for its polar bears, beluga whales, and migrating birds, and there he had his first encounter with Inuit sculptures.